Are you a Business Owner or Management head or Marketer? Come learn know how to implement and sustain a successful Social Media marketing strategy for your Organization. 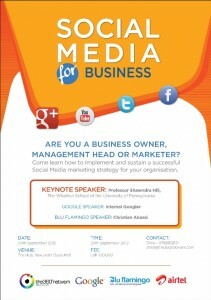 The 360 Network, Blu Flamingo & Google Uganda will be hosting a Social Media Marketing for Business event on Thursday, 20th September 2012 at the Hub, Nakumatt Oasis Mall, from 6:30pm to 9:00pm. This intensive Social Media Marketing Event will feature a series of interactive presentations, actual East African and Ugandan case studies of companies that have successfully implemented Social Media as their greatest marketing tool, Q&A sessions and a networking cocktail. The speakers will explain everything any Management Head or Business Owner needs to know on how to implement and sustain a successful Social Media marketing strategy for their Organization. This event is specifically targeting: Heads of Marketing, Marketing Managers, Business Owners, Media Agency Managers, Communication and PR Executives, Brand Executives, MDs and C-level Executives of consumer facing brands, Business Development Managers and Marketing Executives. Thanks for the heads up this would be a good opportunity for like minded professionals to pick each others brains. Thanks for the post- much appreciated.